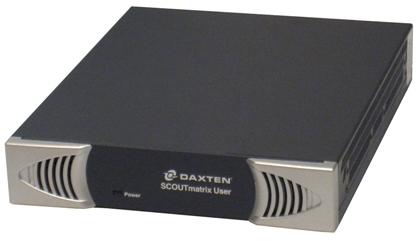 The Daxten SCOUTmatrix is a KVM matrix management switch that provides 24/7, out-of-band BIOS level management for the high-density server room and data center. It is a secure, flexible, and supremely scalable centralized management solution. It enables up to eight IT managers to simultaneously access hundreds of servers and network devices from any location. The Daxten SCOUTmatrix kvm switch provides five functions in one unified solution: KVM switching and control, Serial control, power management, user management and remote access. These functions are unified by Daxten's Central Management System (CMS). CMS is a hardware embedded, Windows-like interface providing out-of-band BIOS level access, topology-independent viewing, and point-and-click management for all KVM and Serial hardware in the server environment. The Daxten SCOUTmatrix kvm switches allows you to seamlessly cascade additional switch layers, allowing you to add hundreds of servers, all controlled from the same CMS interface. CMS ensures that users experience a transparent, topology-independent view of their servers and devices, without the complication of viewing the additional hardware or physical connections. The Daxten SCOUTmatrix kvm switch features user-name and password authentication including up to 32 user profiles and 4 levels of user access rights for increased protection. Additional security is provided by the ability to relate user names to their designated servers regardless of changes to their port configuration. The SCOUTmatrix Server Direct is a crash cart accessory that increases user flexibility by allowing you to bypass the SCOUTmatrix and connect directly to the servers. It connects to PS/2 console via CAT5 cable to CPU-Adaptors types: PS/2, Sun, and USB. The SCOUTmatrix user unit enables analog KVM capability up to a distance of 100m from the SCOUTmatrix central unit. The optional SCOUTmatrix IP user unit enables remote digital KVM/IP capability from anywhere in the world over the LAN or WAN supporting 128-bit SSL encryption. Daxten SCOUTmatrix can be centrally managed by KVM.net. KVM.net is a centralized KVM/IP access management solution for the enterprise server and network environment. It is designed to command your entire IT infrastructure, wherever it may be in the world, from a single interface presenting a logical and unified view of your hardware.